Passing through Mangaung District, the Free State’s cultural and political heartland, the Cheetah Route’s abundant historical, cultural and natural attractions make for a top business and recreational destination. The main towns on the route are Bloemfontein, Botshabelo and Thaba-Nchu. The beautiful city of Bloemfontein has a wealth of attractions. Enjoy a panoramic view of the city from Naval Hill Precinct, which also hosts the Digital Planetarium, a Fragrance Garden for the Blind, the 250ha Franklin Game Reserve, an iconic 6.5m tall bronze statue of Nelson Mandela, and a picnic spot. Marvel at flora on display at the Botanical Gardens and the Orchid House. Take in cultural hotspots such as the Oliewenhuis Art Museum & Gallery and the Sand Du Plessis Theatre, or lose yourself in one of the many museums, including the Anglo-Boer War Museum, the Choet Visser Rugby Museum, the SA Armour Museum, the Fire Station Museum, the National Museum, home of the archaic hominid Florisbad skull, the Queen’s Fort Military Museum and the National Women’s Memorial. Botshabelo offers a vibrant township tourism experience. Enjoy a traditional chisa nyama barbeque and slake your thirst in a shebeen, or pay your respects to the veterans of the struggle at places such as the Free State Youth Martyrs’ Monument, the house of Me Moipone Mohlakoana, who was a member of the 1952 Defiance Campaign, Ramkraal Prison, where many freedom fighters were incarcerated, Paradise Hall, where the 1952 Defiance Campaign assembled, and Mapikela House. Thaba Nchu takes its name from the towering Thaba Nchu mountain, home of the Barolong nation in the 1830s. Visit the Chief’s Kraal, or go to Ratlou Location, birthplace of Dr JS Moroka, who was President of the ANC from 1949-1952 and whose home, Moroka House, is a national monument. Other local attractions include Maria Moroka National Park and Rustfontein Dam and Nature Reserve. 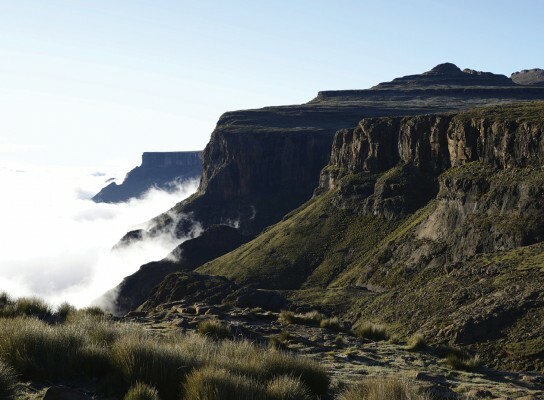 Following the Free State’s southern border with Lesotho, the Eagle route runs from Ficksburg to Harrismith along the Free State’s southern border with Lesotho. Featuring some of South Africa’s most picturesque landscapes, the Eagle route offers activities such as cherry picking, fossil and rock painting viewing, arts and craft shopping, horse riding, 4X4 trips and even skiing. Travel to natural wonders such as the huge rock shelter called the Stables near Ladybrand, where Boers stabled their horses during the 1858 Basotho War, the mystical traditional ancestral worship site of Motouleng Cave, with its sacred spring, outside Fouriesburg, or the wind- and rain-sculpted majesty of the Golden Gate Highlands National Park, near Clarens (also famous for its many arts and craft shops and galleries). Nature lovers have spoilt for choice, with experiences including bird watching amidst the sandstone cliffs and caves of Meiringskloof Nature Reserve, the birding paradise of the Seekoeivlei Nature Reserve, a 30sq km wetland with international RAMSAR status, or the big cat rehabilitation and breeding centre of Lions Rock, near Bethlehem. Passing through Deneysville, Sasolburg, Parys, Vredefort, Kroonstad, the Lion Route is most famous for the watersports and fishing activities available along the Vaal River and the Vredefort Dome, the world’s oldest and largest crater and a World Heritage Site.Now, for added flavour, you can taste some of the best wines in the world on the Riemland Wine Route. Two farms in the Heilbron District near Sasolburg have come together to create an authentic Cape wine tasting experience, complete with wooden tables in 100-year-old cellars, narrow-rimmed wine-sniffing glasses and spittoons.Sample the boutique wines of Kloovenburg Vineyards, Shiraz Country, Riebeek Kasteel, Groote Post and Babylon’s Peak at Francolin Creek, or pop into Goedehoop Wine Cellar to enjoy the popular Van Loveren wines from the Van Loveren Estate near Robertson. Traversing the important agricultural and gold-producing area of Lejweleputswa District, via the towns of Bothaville, Welkom, Ventersburg, Virginia, Winburg, and Brandfort, the Flamingo Route offers an interesting variety of leisure activities. Combining a visit to a local gold mine with trips to game farms, key historical sites such as Winnie Madikizela-Mandela’s former home near Brandfort, and the world’s second largest private agricultural show, the NAMPO Harvest Festival, held at Bothaville every May. For an unexpected adrenaline rush, though, head on over to the Phakisa Freeway Race Track on the R70 outside Welkom. Constructed in 1998, it’s the world’s fourth fastest track, with a Formula 1 Grand Prix flat circuit and a Super Speedway Oval, and Africa’s only track to host MotoGP events. National and international races hosted at Phakisa to date include six World Motorcycle Grand Prix events, the South African Motorcycle Grand Prix, the National Super Series and the Midas Historics Tour. Much like the town of Welkom itself, the 12m-wide Grand Prix Track is rated as very safe but also tremendously demanding. The Phakisa Freeway Race Track is also the only motor racing track outside the USA to have a speedway track. Connecting the Free State with the Northern Cape, the Springbok Route meanders through the Xhariep District’s scenic farmlands and nature reserves. Battle sites, rock paintings, game farms and diamond mines are just some of the cultural and historical magnets along the way. The Springbok Route overlaps with the Diamond and Wine Route, which follows the original diamond prospectors to the region. Visit the open diamond mines at Koffiefontein, whose diamonds are prized the world over, and the enormous man-made diamond hole outside the village of Jagersfontein, which, with a top area of 19.65 hectares, is 2.65 hectares larger than the more famous Big Hole of Kimberley. Nearby Jakobsdal are the wine farms of Landzicht and Wilreza, while the Magersfontein Battlefields and Museum are 20km out of town.